Time for a demographic check-in. Who lives in public housing in Chicago? Here are 7 charts to break down the Chicago Hosing Authority’s data. All figures are based on the latest available demographic information from the CHA’s 2012 Annual Report. There are about 10,000 families (averaging 2.62 people) living in three forms of public housing in Chicago – traditional developments (aka “projects”), scattered sites, and mixed-income developments. In 2012, they added up to 23,366 residents. 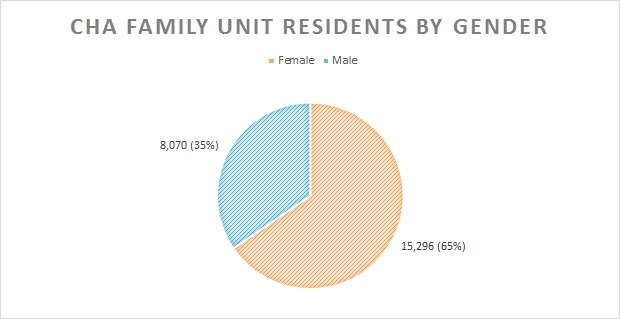 Most public housing residents are women. And about half are adults between the ages of 18 and 61. 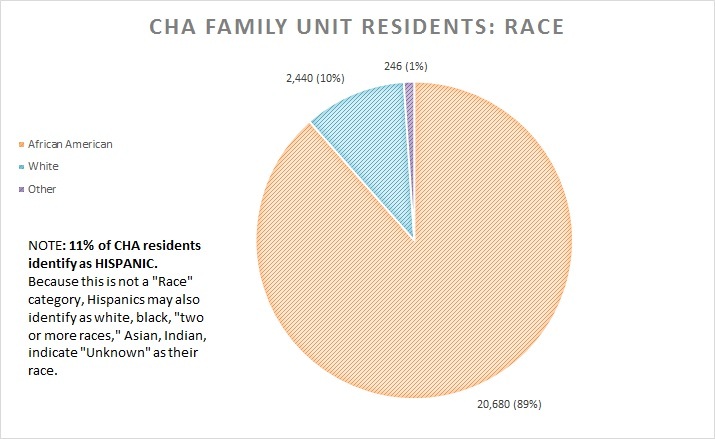 Most public housing residents are African American and 11% of CHA residents also identify as Hispanic (which could be white, black, or Other). The “Other” category includes residents of Asian/Hawaiian/Pacific Island descent, Native Americans, “two or more races,” and residents whose racial backgrounds are unknown. 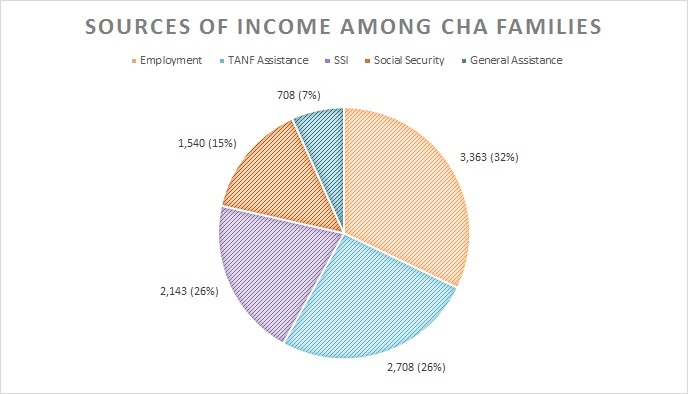 In 2012, the average annual household income of a CHA family was $13,856. Most frequently, families made between $8,000 and $16,000. 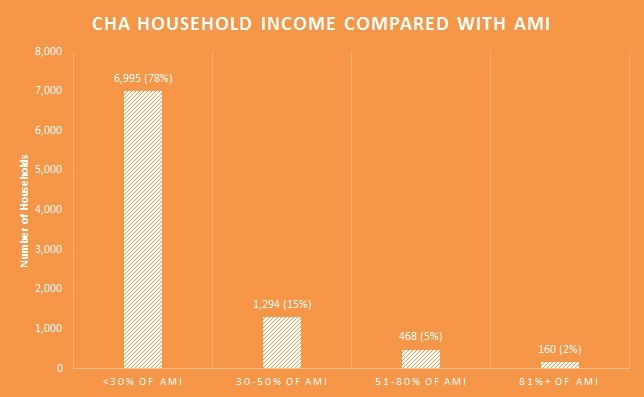 The vast majority of CHA families were extremely low income households making less than 30% of the Area Median Income. The federal government currently defines Area Median Income for the Chicago region as $72,400 for a family of four. Contrary to popular belief, more public housing households rely on income from employment than from welfare programs such as Temporary Assistance to Needy Families (formerly known as Aid to Families with Dependent Children) or EarnFare. 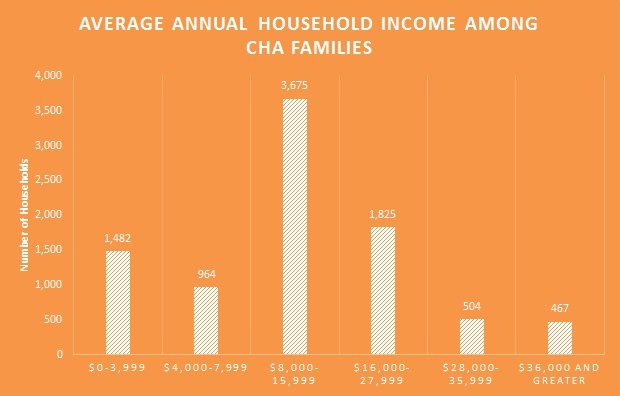 The CHA’s data only shows sources of income for heads of household, not additional family members. In families where heads of households are disabled, for example, other family members may likely be earning income. Supplemental Security Income (or SSI) is a program designed to provide assistance to the elderly and disabled. Social Security targets the elderly and retired. General Assistance is a now-defunct City of Chicago welfare program. 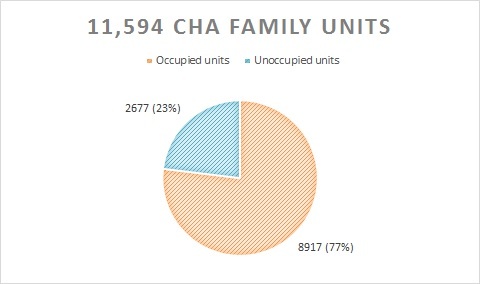 Finally, although, there is a severe shortage of affordable housing for low-income families in Chicago, almost a quarter of the CHA’s family units are actually vacant. 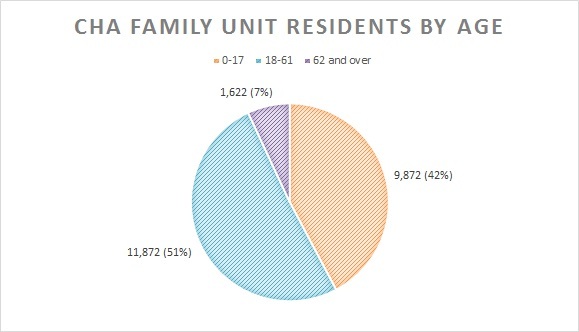 In addition to the CHA’s family housing, in 2012 there were 9,699 seniors living in 8,770 units of CHA Senior Housing. Over 38,000 low-income households in Chicago rent in the private market with Housing Choice Vouchers (Section 8), which sends federal subsidies through the CHA directly to private landlords.